Now that Autumn has permanently settled in and we are slowly but surely going into Winter my mood cannot be more festive and I can’t feel any cozier. I’m currently snuggled up in bed with my favorite wooly jumper, writing this post, whilst sipping on my favorite Chai Tea Latte and I feel truly and deeply happy. There is something so wonderful and positive about this time of the year when we are all looking forward to Christmas, decorating out houses, eating yummy comfort food and spending time with our loved ones, that just makes me incredibly happy and full of hope! I’ve never been big on blindly going with the trends and digging out my dark nail polishes when September hits the calendar, but I must admit that this year I did exactly that. In my defense, I can say it was purely because I wanted to fully feel the magic of the season and dive straight into it haha! 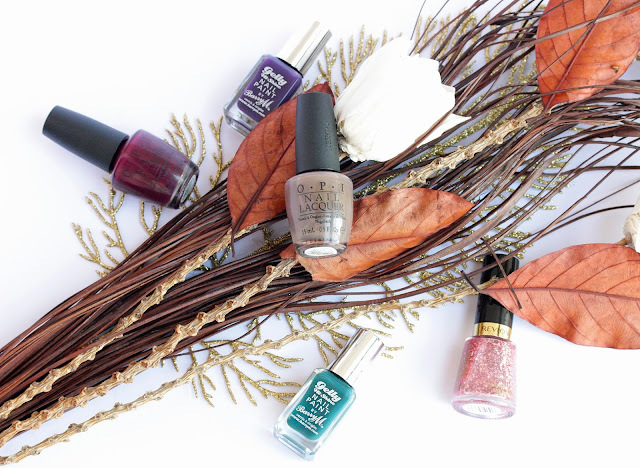 With that being said, I’ve found the perfect five nail polishes that have been and will definitely continue to be glued to my fingernails until the chilly months are behind us. 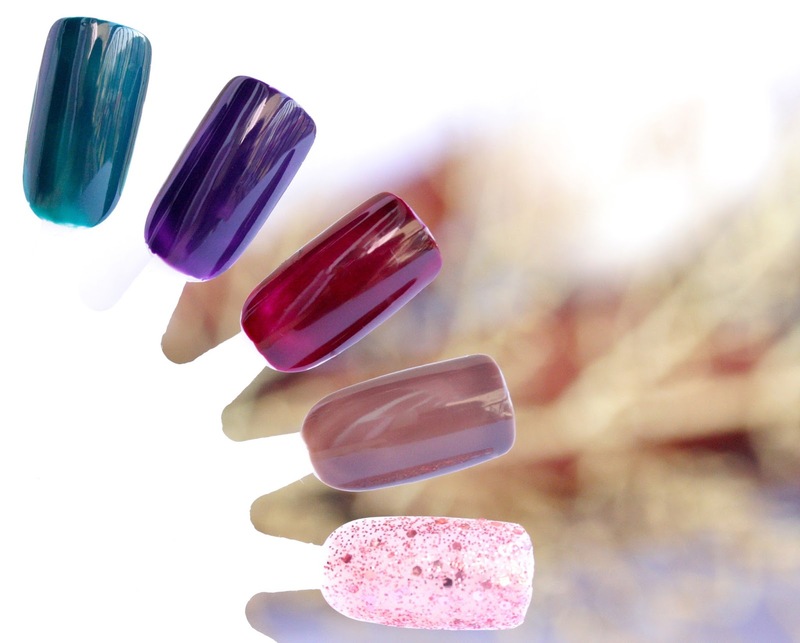 When December rolls in though, I’ll surely pull out some reds and add them to my ‘most used polishes’ rack but more on that later :), today I will talk about my top favorite shades for A/W 2013! Hope you’ll enjoy! Keeping up with the Barry M theme, another one I couldn’t pass in Boots was Plum. I am obsessed with anything plum-y for the season – clothes, accessories, lipsticks, nail polishes - you name it! However, Plum didn’t look very plum-y in the store but I blamed it on the lighting haha. When I got home though, I realized that I was completely right and Plum is more of a blueberry / indigo-ish shade but I loved it regardless. It is a very unique shade and I don’t own anything like it so I happily welcomed the confusion. As far as the formula goes though, I will have to say that it differs from Watermelon and not in a good way. It is again, quite think, but this time it feels a bit gloopy and waiting for it to dry is the biggest chore… Apart from that Plum is pretty glossy and opaque and stays on my nails for about five days. I have a full on review (here) of this nail polish so I won’t go into too much detail, but let’s just say that this dusty brown grayish taupe is right up my alley. I love shades like this as they go with any outfit and look very feminine and classy. This babe was my go-to fall/winter nail shade last year and it has made quite a comeback this year, so this has to tell you something. :) The formula of You Don’t Know Jacques! is okay. It applies a bit watery and to get full coverage I need three coats but on a brighter note it dries very fast so it’s not that big of a deal. The polish is not at all streaky and wears for about five-six days with minor chipping. Wait what? No Essie nail polishes among my Top 5? I just realized that and it’s weird, having in mind we all know I swear by Essie! Anyway, I guess I will have to go fix that and have a proper look at their autumnal shades! If I end up falling in love with anything knew I would definitely let you know but for now these five beauties have been keeping my nails company. :) Have a wonderful day everyone and let the Christmas countdown begin hehe! The O.P.I shade is so pretty! Even though it's watery it still sounds like such a good polish. We'll always have Paris is such a great color! Loving it. 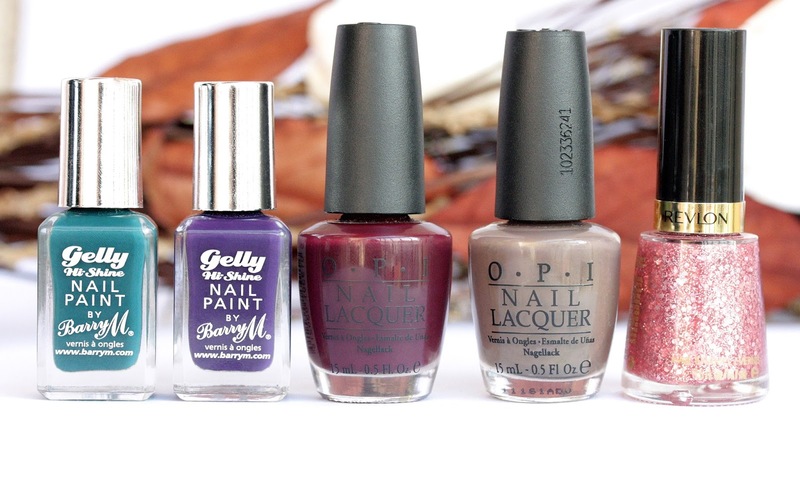 They all look perfect for Autumn! All the colors are pretty. I like the burgundy one the best. the barry m watermelon is one of our favourites too! What lovely picks! The OPI and Barry M shades are stunners! We'll Always Have Paris looks gorgeous! I also really like the Plum polish! These are all gorgeous shades! I especially like the Watermelon shade, I only wish we had Barry M in the US as I've read so many wonderful reviews on the range. We'll always have Paris is a gorgeous colour, definitely up my street! Plum is one of my favourites :) it's so nice! I pretty like the Revlon one too !